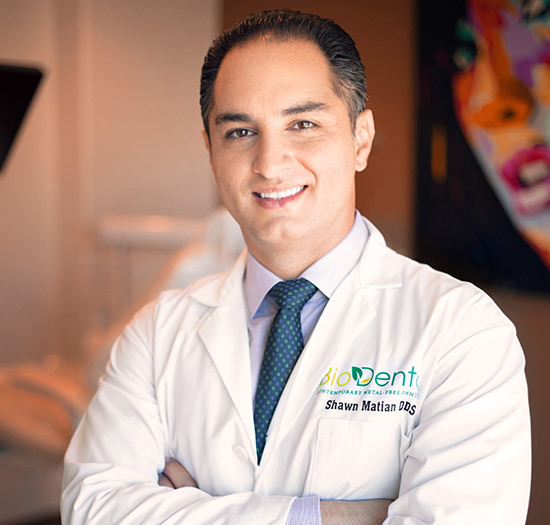 Dr. Shawn Matian is a fully accredited general dentist in Encino, specializing in contemporary metal free cosmetic dentistry. His goal is to provide his patients with affordable and quality dental care using the latest scientific technology available, including the revolutionary CEREC chair-side system of restoration. Dr. Matian has trained extensively in the use of CEREC and through this technology is able to provide his patients with crowns, veneers, onlays and other restorations during one office visit. While he offers a full range of dental services at his state-of-the-art office, his passion is cosmetic dentistry. Dr. Matian enjoys the challenge of restoring a happy beautiful smile to his patients using both his technological skill and his intuition as an artist. He is also committed to providing only biocompatible materials when doing restorations to avoid future health-related problems arising from metal materials. Choosing to be a dentist in Encino was a natural choice for Dr. Matian. He grew up in the San Fernando Valley where he attended school. His decision to enter dentistry was influenced in part by his family connections; both his father and his uncle are dentists. Another strong influence was Dr. Matian’s ongoing interest in computer technology. After graduating from high school, he earned a Bachelor of Science degree in Computer Science in 2000. He decided to pursue a career in dentistry when he realized the potential of blending both fields of education. After a brief application process, Dr. Matian was accepted into the prestigious Ostrow School of Dentistry at the University of Southern California. Once his study was underway, Dr. Matian was immediately attracted to the emerging dental technologies, including metal-free dentistry, CAD/CAM technologies and dental implants. USC is on the forefront of dental education, including biomimetic dentistry, which reconstructs teeth in a way to mimic their natural aesthetic form and function. During this time, Dr. Matian developed his clinical skills under some of the most respected dentists in the world. He found particular satisfaction in the applying his creative and artistic skills in the field of cosmetic dentistry. He excelled in his studies, becoming one of the few students allowed to perform cosmetic and implant dentistry as an undergraduate. Dr. Matian graduated with honors from USC in 2008. Following his graduation, Dr. Matian began working as an associate dentist with a high profile holistic dentist. It was during this time that Dr. Matian developed an appreciation and understanding of biocompatible dentistry. To this day, it remains a primary practice philosophy to use nothing but biocompatible materials in all procedures delivered in his office. Dr. Matian created Bio Dental in 2009 while continuing his work as an associate dentist in Encino. He began by seeing his own patients one day per week. In 2013, he decided to dedicate his full schedule to developing Bio Dental, officially opening his practice in a private, state-of-the-art facility. Dr. Matian is certified by the American Board of Public Health and has completed postgraduate training as a dental pain specialist. He maintains memberships in the American Dental Association, the California Dental Association and the American Association of Cosmetic Dentistry (AACD). He is the instructor for Porcelain Veneer hands on course at Da Vinci Dental Studios. Dr. Matian currently resides in Tarzana, California. When not practicing dentistry, he enjoys spending time with his wife and 2 children, reading about technology and science, working out, and traveling.